Isn't it amazing how history repeats itself? My adopted dad from 3 months of age, Douglas Anderson, lived through the Great Depression. Then he became a small town capitalist. He needed loans to roll over inventory. I learned about procyclical bank behavior at a young age. He had to plead with a banker once, in the early '60s if memory recalls, to roll over inventory, convincing him that the bump in the economy would be short-lived. I am sure a lot of that pleading took place on a much grander scale during the Great Recession. There are lots of examples of banks not foreclosing on wealthy homeowners, and of loans being extended for large corporations. Don't be a small guy like my dad and expect to avoid the procyclical hammer in modern America. I miss him. He probably shortened his life by the excessive workload that small business required. No computer systems to help out in those days. I found out about my natural father through DNA testing done in 2017. Turns out he was older (b. 1900) than my adopted dad, and a labor man, a union leader by the name of Armando Ramirez. He is well documented by Cornell University. He was a negotiator and a leader of men, and most of his career was spent in leadership of tobacco rollers. He ended his career in the 1199 nurses union of NYC, where he fought for better wages for nurses. They were mostly minorities and he took them on strikes to get them a better life. He retired as Vice President of the union. Armando was also into radical politics. He was, for a time, a member of the communist party. In the 30's, in the throes of the Great Depression, people looked around for alternatives to capitalism. It was not uncommon for men to join the communist party, or seek a fascist populism. I was always taught that communism was left wing and fascism was right wing. And remember, in the 1930's, neither communism nor fascism had yet failed! 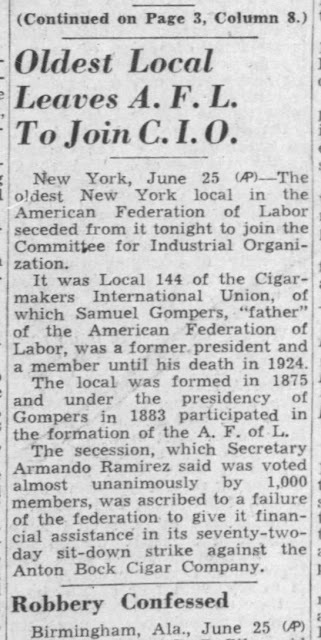 Turns out that Armando was keen enough to resign the communist party when the Taft-Hartley bill required it as a means to continue in union leadership. It was also called the slave labor bill, and that is a fairly accurate assessment. Unions were weakened after that. I did find this article both educational and interesting, although a bit disconcerting in places. There is no organization so great and successful that poor leadership can not destroy it. I have seen that happen in great businesses and it is always painful to be part of it. Thanks, William. So many organizations miscalculate and fail. Lots of big box stores before Walmart, the old American basketball association, which failed to retain rights on its red white and blue ball, Sears, and maybe the good old USA. Although we hope succeeding presidents have more business savvy than the billionaire who would have lost everything were it not for his father.